Exotic 3.0 ransomware uses sophisticated techniques to infiltrate computers and hide from its victims. Use Reimage to determine whether your system is infected and prevent the loss of your files. What methods were used to attack your PC and successfully infect it? New file extensions on encrypted files is not a new technique, and many ransomware viruses do this to make the victim see how many files have been corrupted. However, not all viruses scramble the original file name, and that’s exactly what this virus does. This way, the victim notices how many files have been encrypted, but loses the possibility to identify which file is which. What’s interesting about Exotic viruses is that they can encrypt executive (.exe) files, which means that the victim loses access to programs. The virus also changes desktop’s wallpaper with an image that contains the same information. 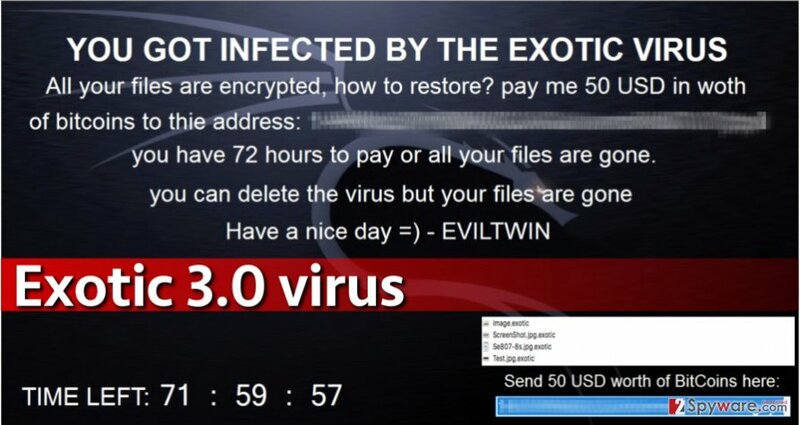 Despite angry threats to delete victim’s files in case he/she refuses to pay up in 72 hours, users should not be afraid to remove Exotic 3.0 ransomware using anti-malware tools. A deleted virus can no longer initiate activities on the computer, so it becomes unable to delete encrypted files. This way, you can save encrypted copies and one day decrypt them with a decryption tool. We believe that malware researchers can create one soon, so be patient. In the meantime, use Reimage software to delete the virus, but Malwarebytes MalwarebytesCombo Cleaner is just as good. Do not forget to prepare your PC for Exotic 3.0 removal first – follow instructions provided below this article. Install a trustworthy anti-malware software for enhanced PC protection. Avoid emails that come from senders of unknown origin. However, do not forget that scammers often impersonate workers of reputable organizations, so do not open each invoice, resume or bill that comes attached to suspicious emails that you were not expecting to get. Crooks might also try to convince you to open attached files by stating that you have a sum of money waiting for your acceptance (via Paypal or another payment system). Please remember – if you do not know who is the sender of such email, or if you do not trust it, better ignore it and delete it from your inbox. Enable automatic software updates or update programs installed on the computer manually. This helps to avoid the menace of exploit kits, which can be encountered in untrustworthy websites and can scan your system for vulnerable software. Exploit kits take advantage of outdated software and use vulnerabilities to infect the system with malware without displaying any pop-ups, alerts, or installation wizards. Save downloads to disk before opening them. This gives time for the computer security software to check the safety of the file. If your anti-malware software finds the file secure, you can open it. 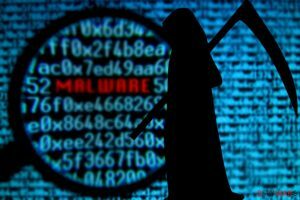 The best way to remove Exotic 3.0 virus is to let an automatic malware removal tool identify its files during the system scan and remove all of them with a single click. Sadly, trying to delete this malicious virus manually can come to a bad end. You might accidentally delete safe and essential files that are needed to maintain a regular system’s performance. Therefore, we encourage you to rely on our recommended malware removers for successful Exotic 3.0 removal. Log in to your infected account and start the browser. Download Reimage or other legitimate anti-spyware program. Update it before a full system scan and remove malicious files that belong to your ransomware and complete Exotic 3.0 removal. When a new window shows up, click Next and select your restore point that is prior the infiltration of Exotic 3.0. After doing that, click Next. Once you restore your system to a previous date, download and scan your computer with Reimage and make sure that Exotic 3.0 removal is performed successfully. Guide which is presented above is supposed to help you remove Exotic 3.0 from your computer. To recover your encrypted files, we recommend using a detailed guide prepared by 2-spyware.com security experts. If this noxious virus has encrypted your files, you must be thinking of ways to recover them. The 100% efficient data recovery option is to use a backup, but we understand that some users might not have one. Sadly, in such situation you can try several data recovery techniques described below, but firstly we advise you to backup your files and be patient – malware analysts might be able to release a free Exotic 3.0 decryption tool soon. There is a data recovery software that seems to be an irreplaceable assistant for those who have their files encrypted, deleted, or simply corrupted. It might not be able to restore .exotic files, but we recommend you to test its capabilities just to be sure. This entry was posted on 2016-11-09 at 01:52 and is filed under Ransomware, Viruses. You can quickly scan the QR code with your mobile device and have Exotic 3.0 ransomware virus manual removal instructions right in your pocket. How did you remove Exotic 3.0 virus?